A common erect annual herb found abundantly in plains that flowers during February-April. 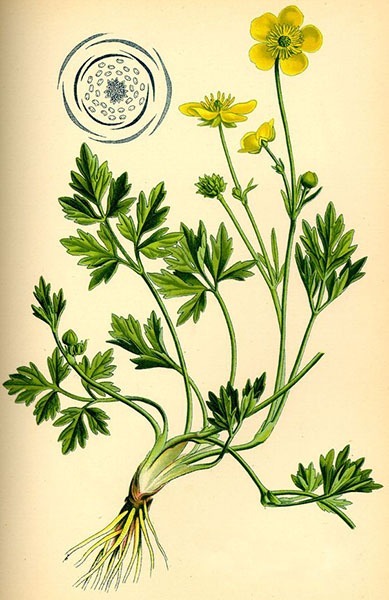 Ranunculus sceleratus is commonly found near water. Tap root, short lived, replaced by adventitious roots. Herbaceous, green, erect, cylindrical, fistular, glabrous and branched. Radical leaves with long petioles, cauline and ramal, alternate, leaf base sheeting, simple palmatifid, exstipulate, reticulate multicostate, glabrous, herbaceous. Simple, solitary terminal or solitary axillary. Pedicellate, bracteate, bisexual, complete, actinomorphic, hypogynous, hemicyclic, yellow. 5 Sepals, polysepalous, yellowish green, slightly petaloid, caduceus, inferior. 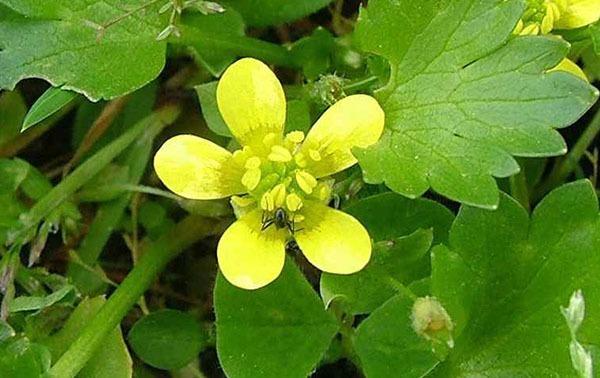 5 Petals, polypetalous, obovate, yellow, each petal having a pocket shaped nectary at the base, inferior. Stamens, indefinite, polyandrous, spirally arranged filaments long and anthers elongated, basifixed, adnate, inferior. Polycarpellary, apocarpous, ovary superior, unilocular, Placentation basal, style short, stigma beaked.